Figure 1. Clinical, histological, and genetic features of the proband in LK family 1. (A) Pedigree. The arrow indicates the proband. 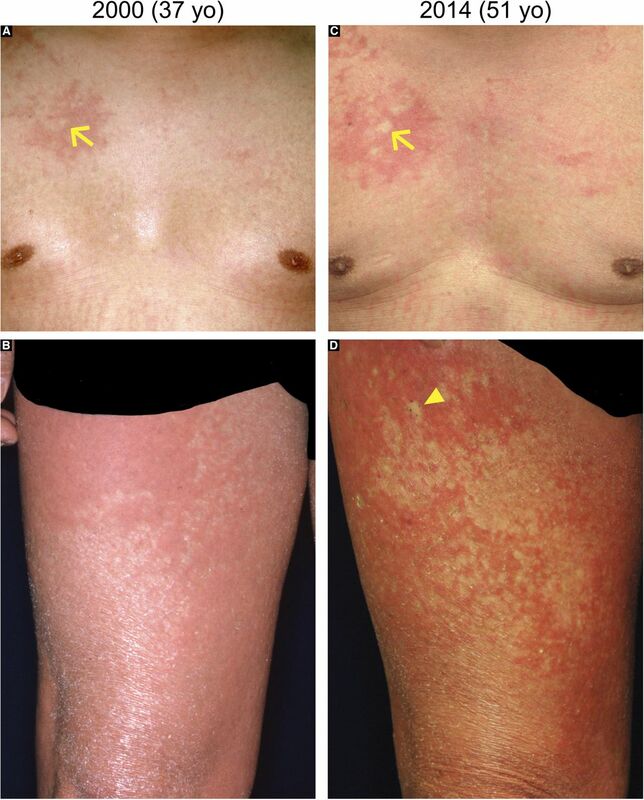 (B, C) Generalized ichthyosis and irregularly shaped erythematous plaques. (D) His plantar skin was diffusely hyperkeratotic. (E, F) Compared with healthy control skin (E), the patient’s affected epidermis (F) showed hyperkeratosis, parakeratosis, prominent keratohyalin granules, and acanthosis. (G) The proband was heterozygous for a 1-bp insertion mutation, c.545_546insG (p.Gly183ArgfsTer153). (H–L) Gross (H, I), dermoscopic (J), histological (K), and genetic (L) features of the revertant spot on his left leg. Note that no scales were observed on the revertant spot (arrows). (K) The revertant spot showed histological normalization. (L) The frameshift mutation was lost in the revertant epidermis. Scale bars, 100 μm (E, F, and K) and 5 mm (I). Figure S1. Clinical features of the affected individuals in family 1. (A–F) The proband presented with PPK, generalized ichthyosis, and irregularly shaped erythematous plaques. (G–R) His daughters exhibited PPK and generalized ichthyosis. Neither erythematous plaques nor revertant spots were observed. Note that their palms showed “honeycomb-pattern” hyperkeratosis (G, M). Figure 2. Immunolocalization of mutant LOR and its C-terminal amino acid sequence. (A–C) In healthy control epidermis, KRT10 and wild-type LOR were expressed by suprabasal keratinocytes and more-differentiated keratinocytes, respectively. No mutant LOR was detected. (D–H) Immunolocalization of KRT10 and wild-type LOR revealed thicker stratum spinosum and granulosum in the affected epidermis than in the control. 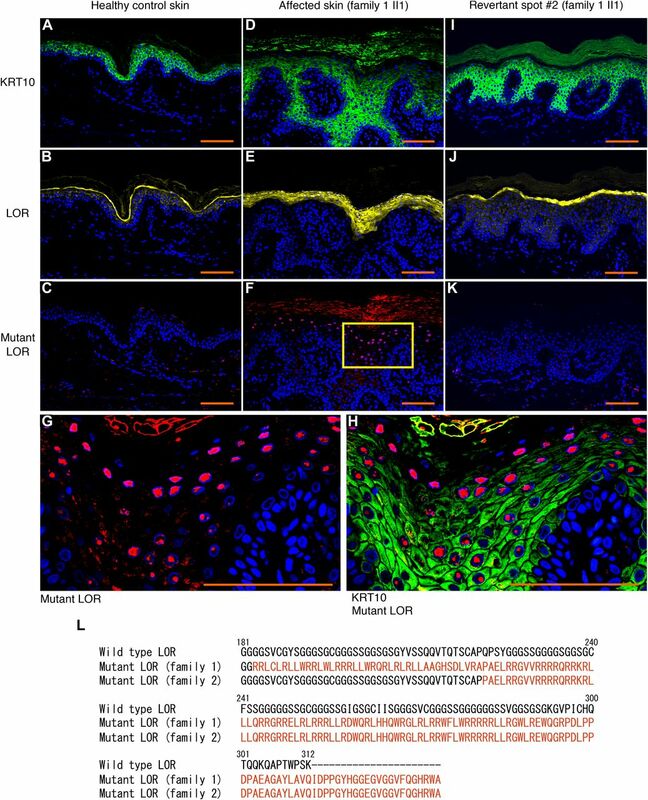 Mutant LOR accumulated in the nuclei of keratinocytes in the upper epidermis. Higher magnification of the square in (F) is shown in (G). Merged image of anti-KRT10 and anti-mutant LOR was also shown (H). (I–K) Immunolocalization of KRT10, wild-type LOR and mutant LOR was normalized in the revertant epidermis. Scale bars, 100 μm. (L) The C-terminal amino acid sequences of the wild-type and mutant LOR. 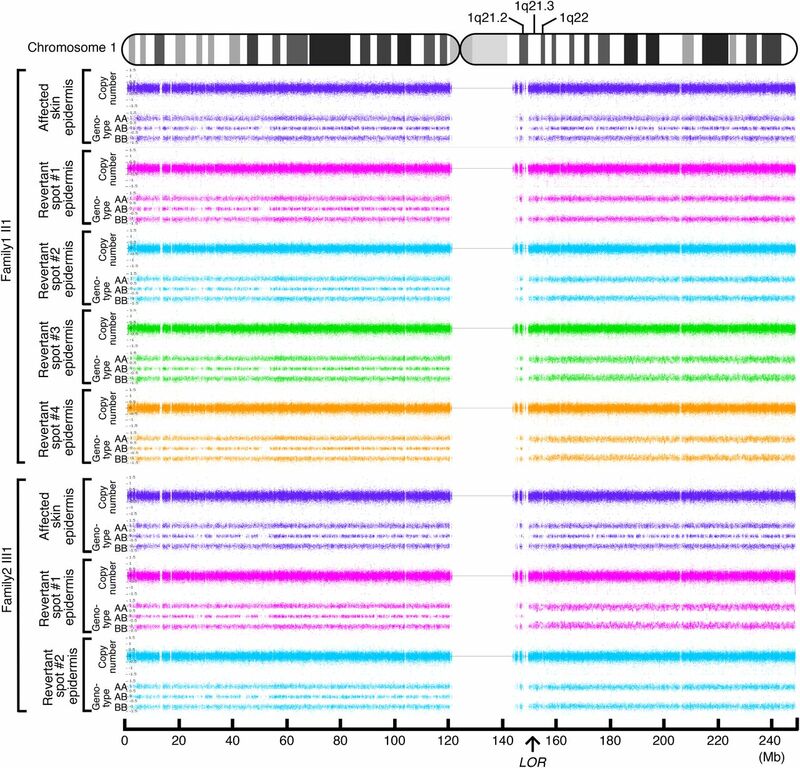 We identified two frameshift mutations in LOR, namely, c.545_546insG (p.Gly183ArgfsTer153) and c.664_665insC (p.Gln222ProfsTer116) in family 1 and family 2, respectively. These mutations replace the C-terminus of LOR with novel arginine-rich peptides (shown in a different colour). The numerical values indicate the amino acid number of wild-type LOR from the C-terminus. Figure S2. Clinical and histological features of revertant spots in the proband in family 1. Skin biopsy was taken from multiple smooth-surfaced whitish spots (A, D, G). Higher-magnification images of the squares in (A), (D), and (G) are presented in (B), (E), and (H), respectively. These spots were histologically normalized (C, F, I). Scale bar, 100 μm. Figure S3. The genotypes of the revertant spots in the proband in family 1. 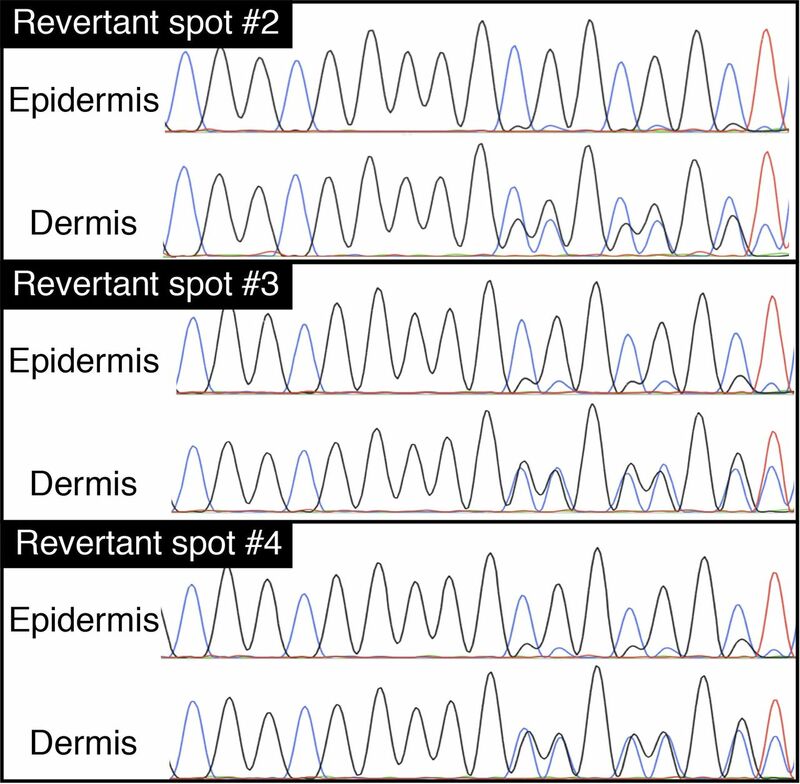 The heterozygous LOR mutation, c.545_546insG, had reverted in the epidermis, but not in the dermis, of the three revertant spots (detailed in Fig S2). Figure 3. Clinical, histological, and genetic features of the proband in LK family 2. (A) Pedigree. The arrow indicates the proband. (B, C) The proband showed PPK with a honeycomb pattern and constricted digits. These clinical images were taken when she was 39. 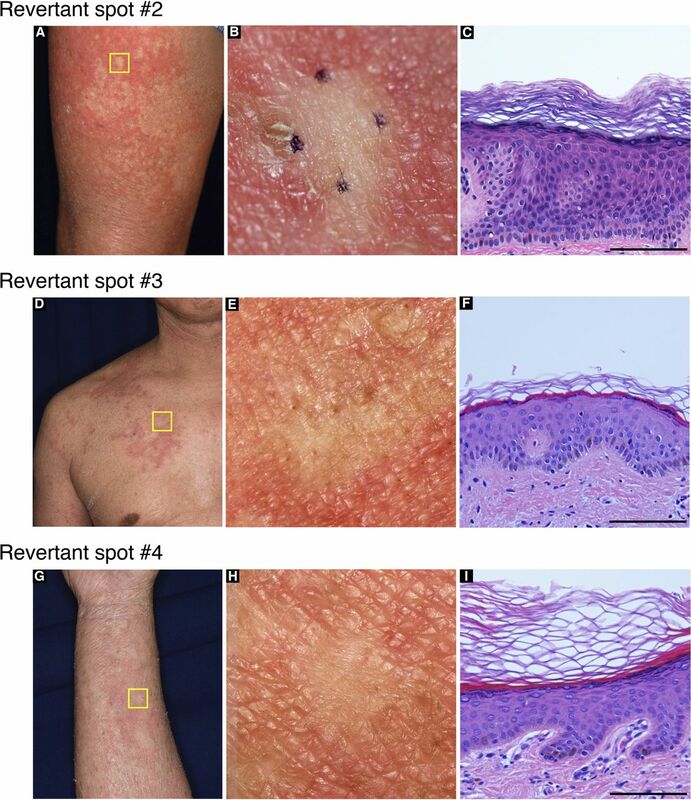 (D, E) Generalized ichthyosis and well-demarcated erythematous plaques. She also presented with dozens of non-scaly whitish skin spots on her left thigh. Higher magnification of the square in (D) is shown in (E). Note that skin biopsies were taken from the affected lesion (asterisk) and two normal-appearing patches (arrow and arrowhead). (F, G) Histology of the lesional skin (G) showed marked hyperkeratosis with parakeratosis and hypergranulosis (F). (H) A heterozygous 1-bp insertion mutation, c.664_665insC (p.Gln222ProfsTer116), was detected in the affected epidermis and dermis. (I–N) The two normal-appearing patches (I, J) displayed normal epidermal architecture (K, L). The frameshift mutation was detected at lower levels in the revertant epidermis than in the revertant dermis, suggesting admixture between revertant and affected cells in the revertant epidermis (M, N). Scale bars, 100 μm. Figure S4. Chronological analysis of revertant spots in the proband in family 1. Revertant spots in the proband of family 1. A comparison of his clinical images from 2000 (A, B) and 2014 (C, D) revealed that “normal-appearing” patches had increased in both size and number. The arrow and arrowhead indicate two representative patches. Figure S5. Long-term observation of revertant spots in the proband in family 2. (A–C) Clinical images of the posterior lower extremities of the proband in family 2, which were taken when she was 27 (A), 39 (B), and 58 (C). (D, E) Higher magnification of her posterior thighs in (B) and (C) demonstrated clinically reverted patches that had increased in both size and number with age. Arrows indicate the largest normal-appearing patch that had been maintained for at least 19 yr on her left posterior thigh. Figure S6. Clinical features of the affected father of the proband in family 2. 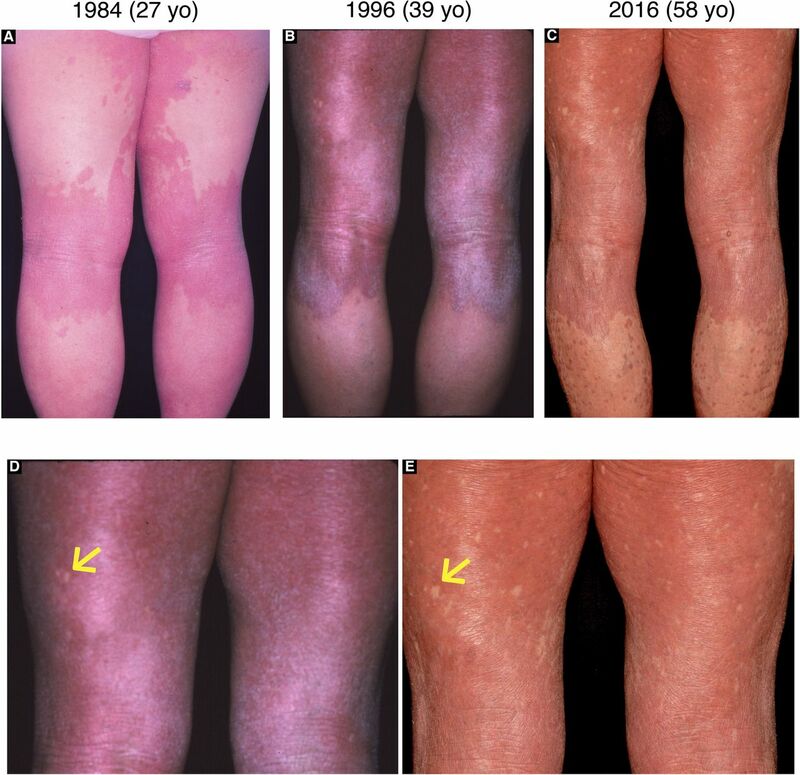 He presented with typical LK phenotypes, including generalized ichthyosis (A, D) and well-demarcated erythematous plaques (D). Notably, he exhibited multiple, clinically reverted skin spots on his extremities (A–E). Arrows, arrowheads, and asterisks indicate representative spots. These clinical images were taken when he was 57. Figure 4. Identification of LOH. Six revertant and two affected epidermal samples were analysed. 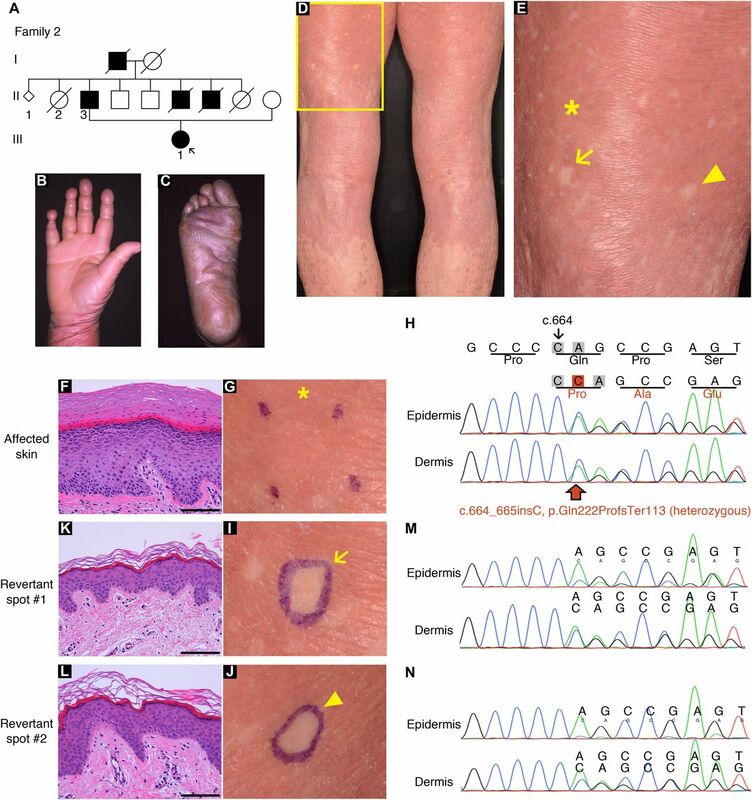 Whole-genome single nucleotide polymorphism microarray analysis identified a copy-neutral LOH on 1q in all of the six revertant epidermis samples, whereas no LOH was detected in the two affected epidermis samples. The LOH began in regions centromeric to LOR and extended to the telomere of the chromosome. Note that no LOH was present on other chromosomes. Figure 5. Cell viability, cell proliferation, and colony formation assays. Flp-In-293 cell lines stably expressing wild-type or mutant LOR were analysed. (A) The ATP-based cell viability assay revealed little difference in cell viability between these cell lines (n = 6). 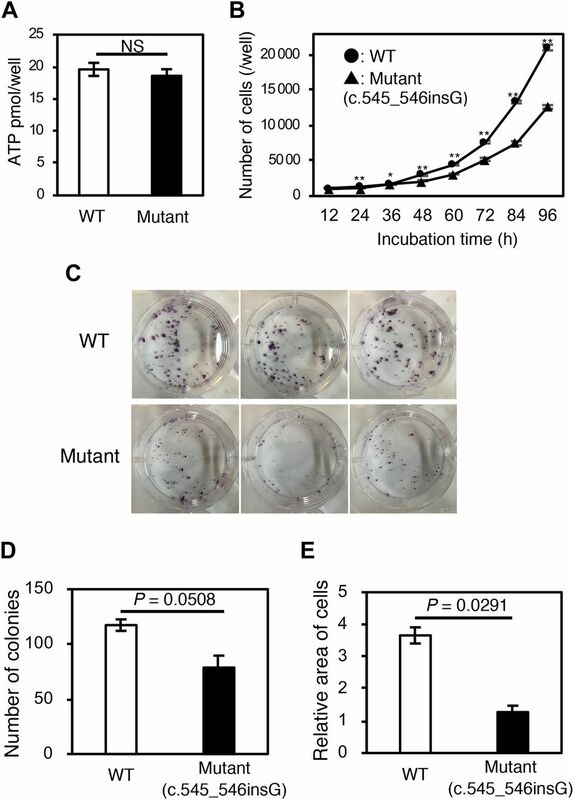 (B) Wild-type cells displayed significantly higher proliferation rates than mutant cells (n = 6). (C–E) Colony formation assay. Wild-type cells formed more colonies than mutant cells, albeit with a borderline statistical significance (n = 3). The area occupied by the wild-type colonies on the culture well surface was approximately 3 times larger than that occupied by the mutant colonies (n = 3). Data indicate mean ± SEM. *P < 0.05, **P < 0.01, P = 0.0508, P = 0.0291 by two-tailed t test. Figure S7. Clinically normal-appearing skin areas in LK patients do not always represent a revertant spot. The proband in family 1 presented with normal skin-coloured areas on his left thigh (A). One of these areas that did not develop on an erythematous background was subjected to histological and genetic analysis. Higher magnification of the square in (A) is shown (B). Histologically, hyperkeratosis, parakeratosis, hypergranulosis, and mild acanthosis were noted (C). Scale bar, 100 μm. 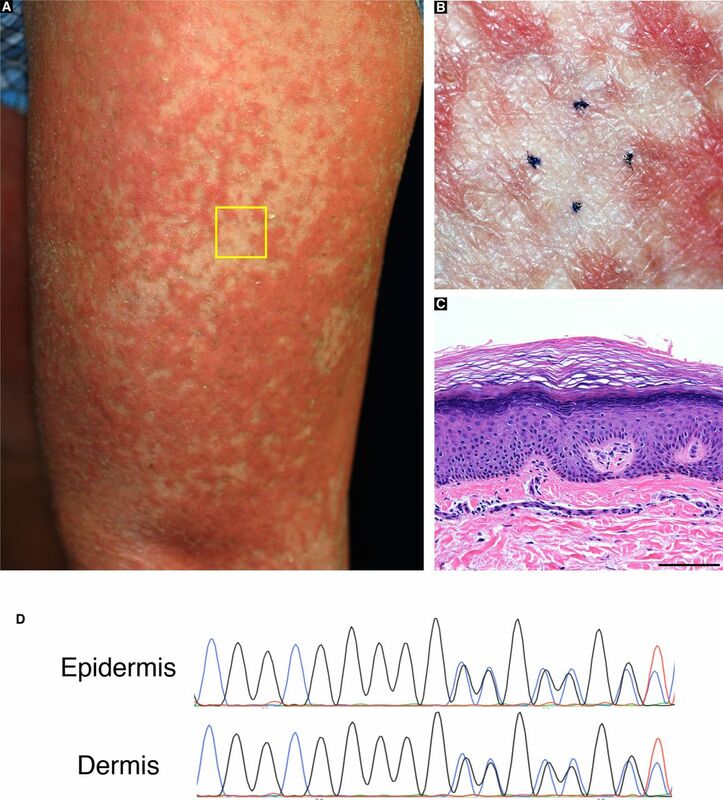 Sanger sequencing revealed that the disease-causing mutation had not reverted in the epidermis (D).